This resource article aims to define funds with donor restrictions and funds without donor restrictions (previously unrestricted, temporarily restricted, and permanently restricted income), and give nonprofit leaders the tools to record, report, and effectively manage contributed income and net assets. 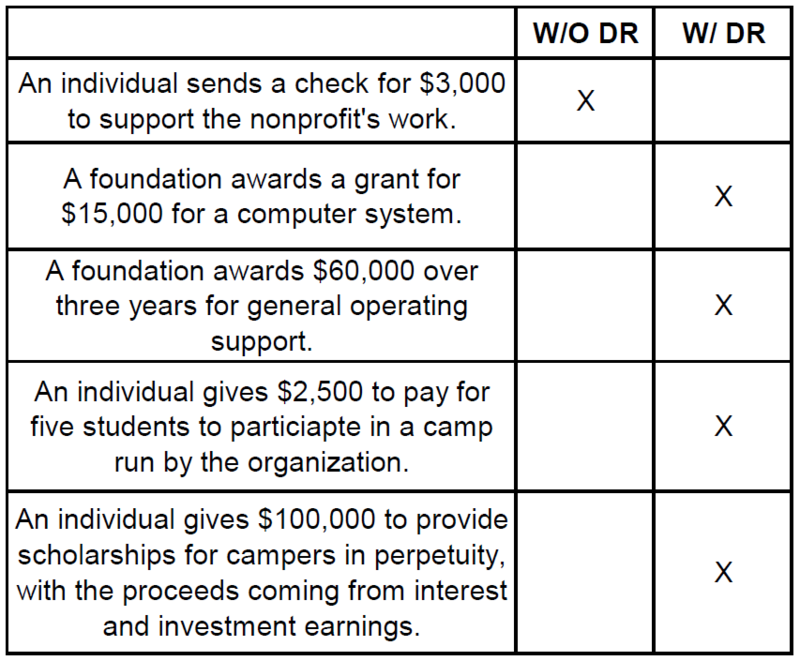 Unique accounting standards require that nonprofits report contributed income in one of two categories: with donor restrictions or without donor restrictions. These income classifications are determined by either the absence or the existence of donor-imposed restrictions on the use of funds. This resource aims to define the difference between the two kinds of income and give nonprofit leaders the tools to record, report, and effectively manage contributed income and net assets. Donors may legally restrict the use of their contributions to nonprofits. The shape and form of the restrictions are defined in the “gift instrument.” The gift instrument is the document that establishes the use of the donated funds. Examples of gift instruments include award letters from foundations and letters from individual donors. These funds are free from any external restrictions and available for general use. These types of contributions used to be known as unrestricted funds, and are often called general operating or general support. Many individual contributions are given without donor restriction. These funds include what used to be termed temporarily restricted (funds restricted to a particular use or time) and permanently restricted (funds that carry a restriction permanently, like some endowments or scholarship funds). They have donor-imposed restrictions that can be satisfied by the passage of a defined period of time (time restriction) or by performing defined activities (purpose restriction). These can be funds from a grant received to operate a specific program or project or individual contributions given with the intent of supporting a particular program or campaign. Funds of this type may also be restricted with the intent that the principal balance of the contribution will remain as an investment forever, and the nonprofit may utilize the interest and investment returns, such as with an endowment. Once a contribution or grant is identified as restricted, the accounting and recordkeeping requirements are of paramount importance. Two principles are at the core of the accounting requirements. First, restrictions are imposed by the donor when they make the gift or grant. Second, income must be recognized, or recorded in the accounting records, in the year that an unconditional commitment for the funds is received, regardless of when the related expenses will occur. These principles add a complexity to nonprofit financial reports due to the timing of funding, which makes accurate and reliable accounting especially important. 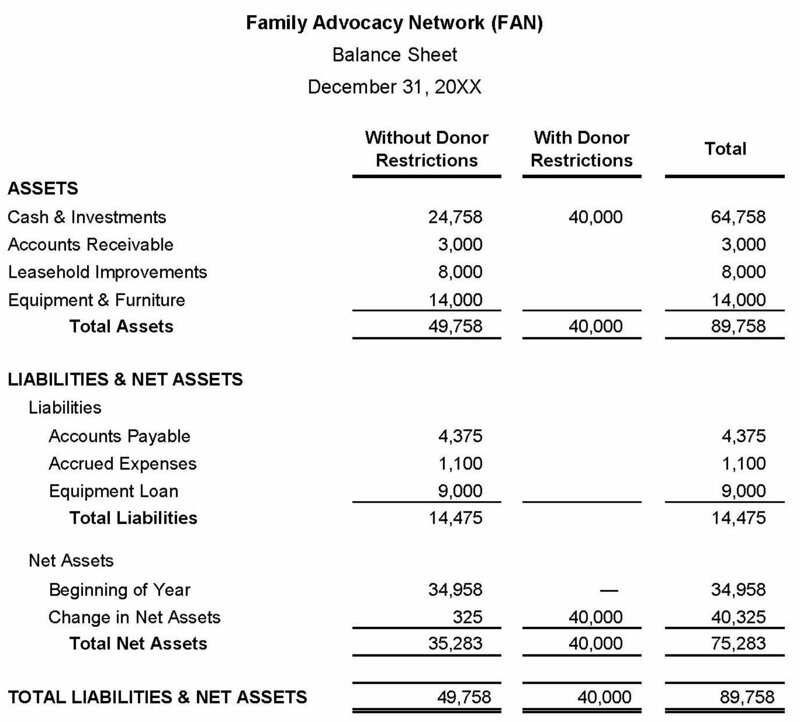 The following examples – an income statement and balance sheet for the fictional nonprofit Family Advocacy Network (FAN) – illustrate how these rules work. The accounting requirements for restricted funds can be managed in a few different ways, depending on the accounting software being used and the sophistication of the chart of accounts. The most effective practice is to display grants and contributions with donor restrictions in a separate column. Using this two-column approach works for both the income statement and the balance sheet. As shown in the income statement below, new income from a grant with donor restrictions is recorded and displayed in the With Donor Restrictions column. When the time or purpose restriction has been met, a journal entry is made to transfer funds from the With Donor Restrictions column to the Without Donor Restrictions column using the “release from restrictions” line item. Accurate accounting is especially important for contributions and grants with donor restrictions that are intended for use over a multi-year period. In the example shown below, FAN receives a three-year, $60,000 grant to support a new program for the years 2018, 2019, and 2020. When the award letter is received, FAN records the full $60,000 as grant income With Donor Restrictions on the income statement. A portion of the grant will be released from restriction in each year of the three-year grant period. 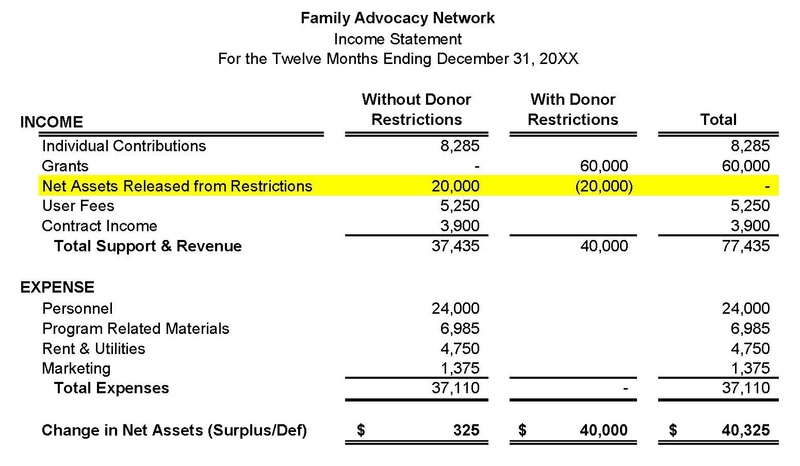 The sample income statement for 2018 shows $20,000 being released from restriction, while the remaining $40,000 remains in the With Donor Restrictions column. The same release of $20,000 will occur in future years two and three of the grant award. The FAN example demonstrates the impact on the income statement of a multi-year grant. Accounting rules require a nonprofit to record all the income of a multi-year grant in the year it is received. If an organization’s income statement shows just total income and expenses without separating the restricted dollars, inflated surpluses can appear in year one of the grant period, along with possible artificial deficits in the remaining years of the grant period. In the FAN example, the total column for 2018 total income shows the full $60,000 multi-year grant and reports a surplus of $40,325. For practical purposes, only $20,000 could be used to support the program during this year. The “Without Donor Restrictions” column is the most valuable tool for monitoring the current year financial activities. The example below is the balance sheet for FAN. This format also delineates funds with restrictions from funds without donor restrictions. By focusing on net assets without restrictions, organizations are given the most accurate and relevant picture of the net assets available for use. For analysis, planning, and decision-making, it is important for an organization to understand what part of their net asset position is without restriction. In this example, FAN has recorded the three-year, $60,000 grant in the first year, as required. After releasing the first $20,000, as shown on the income statement, the remaining balance of the grant award for years two and three is shown on the balance sheet as assets with donor restrictions. These funds are included in the total net assets on the balance sheet, but they are not actually available to the organization to use in any way except according to restriction. For this reason, it is strongly recommended to report restricted dollars separately, and to pay particular attention to the unrestricted amounts when planning and making operational decisions. In addition, directors and managers need adequate training to understand the nuances of restricted funds that present financial management challenges unique to nonprofit organizations.